Welcome to Nilam Resources Inc.
Nilam Resources Inc. is a precious metal mining company with principal assets in Peru (South America). As a publicly reporting company on the OTC exchange (NILA.OTCQB), Nilam Resources is engaged in serving the growing demands for mineral resources and long term geological operations. As we always strive to keep up with high working standards and services we do not underestimate the advance a portfolio management software provides - this is why we use one of the best there is on the market. Nilam Resource is deeply committed to responsible corporate practices and accountability for our actions. Our first concern is to the Nilam shareholders, but with that said, we must be committed to all of our actions from grass roots to the final execution stage and beyond. We will always attempt to be as open as possible. Long-term success is based on consistency of performance, and our corporate infrastructure fosters a deep sense of commitment to excellence through tightly knit principles of operation. 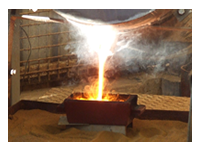 Nilam Resources Inc. (NILA.OTCQB) is a leading producer of gold and precious metals in South America. NILA is currently focused on extraction of large mineral deposits from two major mines in Peru.